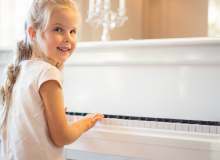 Piano Lessons have incredible benefits to children, including enhanced early development of motor skills and cognitive skills (such as memorization, math, and split concentration), as well as benefits that last a lifetime, such as an emotional outlet, building confidence, discipline, perseverance, and learning what it takes to master something. While it's an amazing journey, it's important to identify when the child is truly ready to start. Maybe your child shows a great interest and aptitude for music! That's a great sign! Take this quiz and find out whether your child is ready for the next step, piano instruction! How does your child respond when s/he hears music that s/he likes? S/he responds by dancing or moving to the rhythm / singing along. S/he sits and bobs her head to the rhythm and/or sings some of the words. It's hard to tell when s/he likes a song because s/he doesn't respond much. What does your child do when they sit at the piano/keyboard? Tries to figure out how to play short tunes by him/herself or by using instructional videos like on Youtube. Plays around and has a lot of fun with making different sounds, experimenting with high and low pitches, loud and soft. Puts their whole palm on the piano or plays random keys and enjoys the sounds of them. How does your child do playing games with rules? Very well, s/he is able to understand and has fun playing games that have 3+ rules. S/he doesn't understand the concept of rules in a game yet. 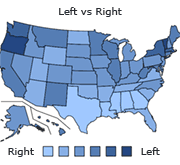 Does your child know the difference between left and right? How well does your child know the alphabet? How well can s/he colour within the lines? S/he is good at keeping colour within the lines. S/he uses colours randomly or has no concept of colouring within lines. How well can your child use scissors? S/he is able to cut simple shapes like a circle or a square pretty well. S/he cuts randomly or doesn't cut intentional shapes yet. How well does your child count? S/he is starting to grasp the concept of keeping track of things by counting, but can't count yet. How is your child's ability to focus? S/he can focus on one thing for 20-30 minutes at a time no problem. S/he can focus for 5, maybe 10 minutes on something if it's extremely interesting to him/her. It's hard to get him/her to focus on anything for more than a minute. S/he needs constant stimulation in order to keep her attention on something. How does your child's hand fit on the keyboard? S/he can comfortably place 5 fingers on 5 adjacent white keys on the keyboard. S/he can stretch 5 fingers across 5 adjacent white keys on the keyboard. S/he can fit her 5 fingers across 4 or fewer adjacent white keys on the keyboard. How is your child's interest in learning how to play the piano? Extremely interested. S/he's approached me to learn to play and/or I've mentioned it to him/her, and s/he hasn't left me alone since! S/he shows a mild interest in learning how to play the piano. When mentioned, s/he expresses that s/he might be interested, but in general, just enjoys playing around on his/her own. Doesn't show much interest in learning (not much response when I mention the prospect it to her) and just has a blast tinkering and playing around, experimenting with different sounds. Quiz topic: Is my Child Ready for Piano Lessons?